By Jon Greenberg on Sunday, January 29th, 2017 at 5:41 p.m. 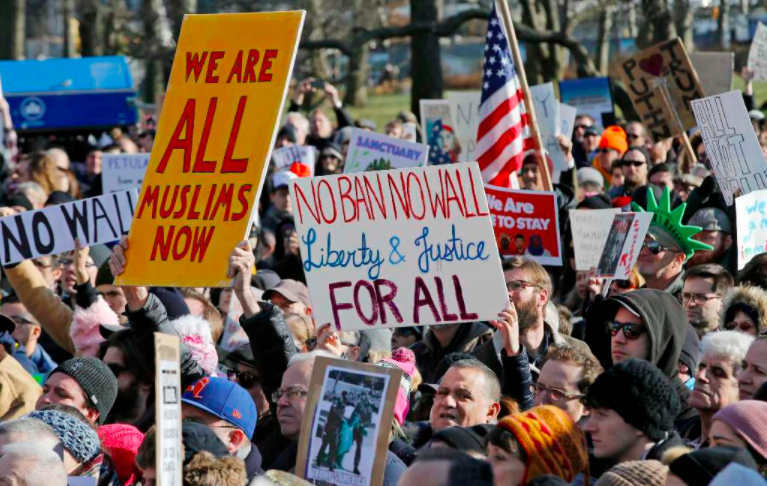 Within a day of President Donald Trump signing an executive order banning entry of people from seven countries, protests sprang up at airports across the United States. Demonstrators and activist groups called the ban unconstitutional, and administration officials scrambled to clarify who would be affected by the new rules. We went through the order to resolve what is clear and what remains murky. The order states, "I hereby suspend entry into the United States, as immigrants and nonimmigrants, of such persons for 90 days from the date of this order." Specifically, the order targets people from countries originally listed by the Obama administration as terrorist hotbeds -- Iraq, Syria, Iran, Sudan, Libya, Somalia and Yemen. Kevin Johnson, dean of the University of California-Davis School of Law, told us the "immigrants and nonimmigrants" wording covers most foreign travelers from those countries. "An immigrant is a lawful permanent resident (a green card holder)," Johnson said. "A nonimmigrant is someone with a visa." There have been multiple reports of both green card holders and people with valid visas being blocked, either after they arrived in the United States, or as they boarded planes overseas. An Iraqi man travelling with his family saw them gain entry at Kennedy International Airport in New York but found himself detained. The order also applies to refugees. Two Christian Syrian families were stopped and sent back to Doha, Qatar, after arriving at Philadelphia International Airport. A judge’s order allowed others to stay pending further review. More broadly, Trump put all processing of refugees on hold for three months and suspended the vetting of Syrian refugees indefinitely, "until such time as I have determined that sufficient changes have been made to the U.S. Refugee Admissions Program to ensure that admission of Syrian refugees is consistent with the national interest." What does it mean for green card holders? While the order calls for suspending the entry of people from the seven nations (unnamed in the order but provided later by the administration), it also gives officials some latitude. "The Secretaries of State and Homeland Security may, on a case-by-case basis, and when in the national interest, issue visas or other immigration benefits to nationals of countries for which visas and benefits are otherwise blocked," the order said. White House chief of staff Reince Priebus emphasized that discretion. For "green card holders going forward, it (the order) doesn't affect them," Priebus said on NBC’s Meet the Press on Jan. 29, 2017. "If you are moving in and out of those seven countries, you will be subject to more questions." The process Priebus described might take place in the weeks ahead, but over the first weekend, uncertainty was rampant. A federal district judge in New York blocked the Trump administration from sending people back overseas. Federal judges in Boston put a one week hold on detaining or deporting anyone with a valid visa or green card. Bill Hing, professor of law at the University of San Francisco School of Law, said the way the order has been carried out runs afoul of the Immigration and Nationality Act. That law, Hing said, protects people if they have gone through the full vetting process and have received a visa or green card. Hing said getting either one involves a lengthy process that includes verification of a person’s identity, reasons for coming to the United States and lack of criminal history. "Under the Immigration and Nationality Act, if you’ve been screened already, and you present a valid visa, you should be able to get in," Hing said. "And if there is any challenge, you have the right to an appearance in front of an immigration judge. That’s not a right under the constitution. It’s in the law itself." Hing said border control officials have the right to question anyone they suspect might intend to harm the United States. That’s called secondary screening after arrival, and Hing said that has been going on under the Obama administration. The process Priebus has in mind would likely pass legal muster, Hing said. How are refugees affected? Does this order single out Muslims? People with visas and green cards are one part of the executive order. The processing of refugees is another. For them, Trump’s order cuts in half the total number the United States will accept in 2017. Experts agree, the president has broad authority to set that limit. For refugees from Syria who have applied for admission, that process is now on hold indefinitely. Many activists have charged that the order singles out Muslims. There are arguments on both sides. The seven targeted countries are majority-Muslim. On the other hand, the reason they ended up on that list is because government officials have said ongoing terrorist training takes place there. That said, the order leaves room for the list to grow. And the order makes reference to the 9/11 attacks and blocking entry for those who engage in "honor killings." That language ties this order to Islamic fundamentalists. Trump issued a statement denying that this represents a ban on Muslims. "This is not about religion -- this is about terror and keeping our country safe," he said. "There are over 40 different countries worldwide that are majority Muslim that are not affected by this order."